Announcement TheClayBungalow 🏡 is open! I’ve made some NEW PIECES and I hope you’ll enjoy looking around the shop. TheClayBungalow 🏡 is open! I’ve made some NEW PIECES and I hope you’ll enjoy looking around the shop. Why Not Make a Regular Mug into a SuperSized 16 oz Mug? In Stock Now! POTTERY BOWL Sgraffito SWIRLS Black and White - Handmade Stoneware- Serving Display Eating! 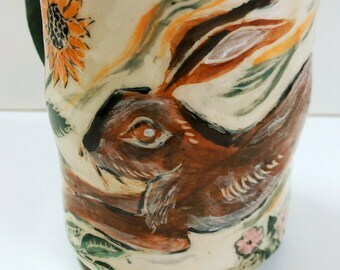 Hand Built SGRAFFITO BUNNY / RABBIT Mug! Bright Blue Color, Handmade Functional Ceramic Coffee / Tea Mug, May Be Personalized! Convert a Regular-Sized Art Pottery Mug into a SUPER-SIZED MUG - Get a Bigger Mug - Include in cart with mug! An awesome, perfect, wonderfully crafted piece of functional ceramic art. Definitely smile worthy! I got this mug for myself because I love the cat design and the colors. I wasn't disappointed when it arrived. In Stock for Your VALENTINE! Stoneware MUG with Cat and Bird - Be MINE - Handmade Sgraffito Carving - Say I Love You! 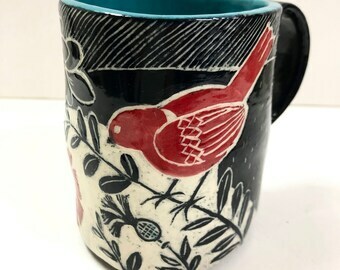 I just listed this fabulous Otomi style mug! Ant the BEST part? ITS IN STOCK AND READY TO GO RIGHT NOW! I tried new colors - Jade & Orange - on this adorable little tray. What do you think? I love it when you guys send photos! What a great review! I have the best customers!! As I drink my coffee from another potter's handmade mug, I'm having a conversation with the mug's maker. I'm learning about intentions and about challenges met and overcome. I can begin to understand that potter's thoughts on design and color, and about whether the maker is concerned with my comfort and pleasure. You know, we chat, the mug, the maker and I. And that is satisfying. I am delighted to make my work with my hands, knowing that soon it will be in your hands. And I do literally hand build my pieces, from slabs. There is often some wonkiness that comes with slab construction, some warping. A mug might be out of round, a bowl might have a high side - flaws that keep us aware of the tenuous cooperation between clay and maker! The technique that I use to decorate my work is called sgraffito. When the clay reaches an almost dry stage, I brush on as many as six coats of underglaze. That gives the piece its color, usually its single color. 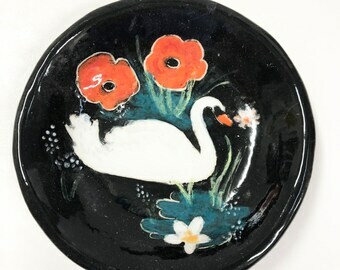 I sketch images and patterns onto the underglaze with a pencil; when I'm satisfied, I carve away the background and expose the white clay body and the image. I love to draw and find that the intensely detailed carving that comes after is meditative. It's a slow process that is fascinating. My inspiration comes from ethnic folk art. When I'm not in the studio, I spend hours looking at images of vintage folk art. I make sketches, seeing how things fit together and produce a certain rhythm and story and humor. Humor is a critical element - I want to giggle at least a little as I work! I opened TheClayBungalow so that I could share the work that I love making. I hope the work will evolve, as my thinking and aesthetic are affected by what I see. I love hearing from you, please keep emailing; it's the beginning of our conversation! I grew up in the '50's, the days of frozen vegetables, home milk delivery and imported Japanese everything. And, I loved to draw - people, landscapes, nicknacks - anything that caught my eye. 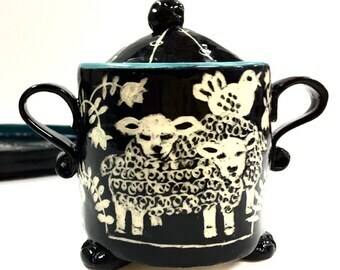 Carol Ross is based in The U.S.A. and has been selling handmade pottery on Etsy since 2011. She sells mainly to buyers in the United States, but offers her items for sale world-wide. He uses Google Cloud to host some of his buyers’ personal information. I'm happy to work with you so that I create a piece you'll love! Please send me an Etsy convo so that we can work out the details. I’ll send you a sketch if you need one and then I'll prepare a custom order invoice. Custom work is time-and-design intense and usually cannot be re-sold . So, once the item is finalized and the invoice has been paid, the sale is final. We do our best to make sure nothing is damaged. In spite of that, if something arrives broken, please let me know immediately. Everything we ship has been insured, so please KEEP THE BOX AND ALL PACKING MATERIALS SO THEY CAN BE INSPECTED BY THE SHIPPING COMPANY! Shipping Costs Seem High - Why so much? Ceramic items are fragile, so of course I pack with this in mind. You know that once a package is out of my hands, it won't be handled with loving care until it reaches your door! I buy new supplies - bubble wrap, packing peanuts and boxes that are not available through USPS. We follow UPS and USPS shipping directives; we wrap securely in bubble wrap and fill the boxes with cushioning materials so that there is no jiggle room. We double box whenever needed, adding extra cushioning for multiple items and large pieces.